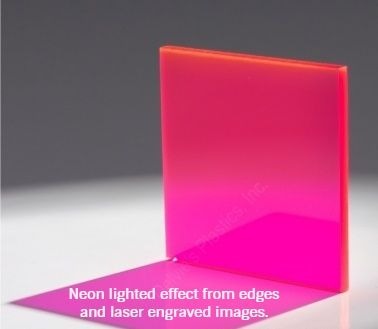 Light Edge/Fluorescent Acrylic reflects light on edges and on edges of laser engraving. 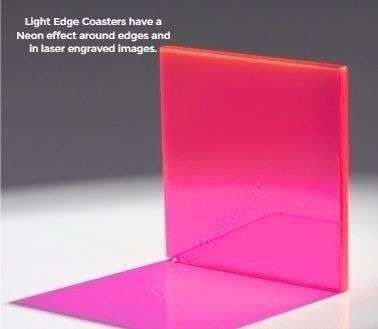 Acrylic used for coasters are referred to as Fluorescent or Light Edge. This is a type of acrylic that has polished edges that reflect light. The light projects as though it is fluorescent or neon. A laser engraved image in the material also will reflect light. The effect of the light is interesting and enticing. Coasters come with a small hole in center of coaster to relieve surface tension from condensation and have silicon pads on corners. Acrylic is a material that is cast and when properly cut from full sheet, with the edges polished, reflect light from polished edges; kind of a neon effect. Because acrylic is light weight we have added a small 1/16 inch hole to the center of the coaster to compensate for surface tensions coming from condensation or spilled liquids. We only offer a red or blue style as that color is best at reflecting light. Coasters can come in round and square with rounded edges. The size for either style is 3.5 inches. Laser engraved image or text will also provide the interesting effect of light reflection or neon effect. Coasters come with silicon pads on the bottom to keep them from sliding and to make it easy to pick them up and wash them. However, do not put coaster in dishwashers or submerge in soapy water other then for timely cleaning. Coasters are 1/4 inch thick, 3.5 inches square or round.